Before I write anything else, I have to say that I'm really loving Scrapple. In all my years living in Baltimore, I've never disliked it, just never had the chance to eat it very often. It's hard to describe exactly what it is without turning some stomachs, but once you get over the ingredients, it's not so bad. There are far worse things out there for you, I'm sure. For someone who's grown up eating a lot of pork, Scrapple really isn't very startling. It's mostly cornmeal flavored with miscellaneous pig parts, the leftover pieces, hooves, skin, and innards, then shaped into a grayish block. How does this the go from packaging to your plate? Well, it's sliced thin, pan-fried until crisp, and served alongside eggs or on some toast, oftentimes drizzled with some maple syrup. (This has become my favorite way of ingesting this stuff.) To me, it has a strong livery taste, spiced with onions, and a slight sweetness of the cornmeal. Think of it as a blue-collar version of paté. The most common brands you'll find in the supermarket are Esskay and Rapa (presumably most locals prefer Rapa brand). I'm partial to the original flavor, but you can also find hot and spicy, Scrapple with bacon, and beef Scrapple. No, that's not whole wheat toast. That's pork product! 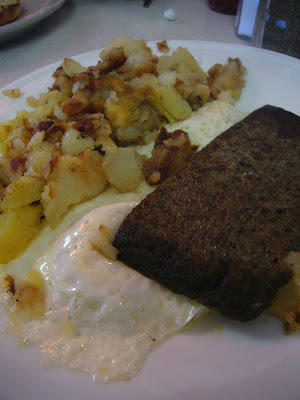 Most of the diners in and around Baltimore offer Scrapple. 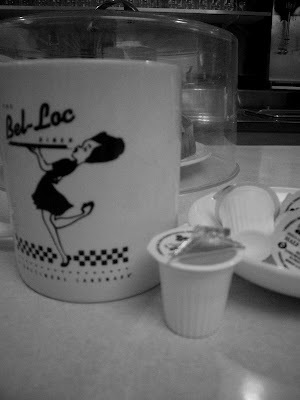 The Bel-Loc Diner is an institution, a step back straight into the 50's. It's the real deal, with the jukeboxes at each booth, the stainless steel milk machine contraption and a row of well-polished milkshake machines. The food literally comes out 5 minutes after you order from your waitress who will no doubt call you "Hon." And the toast is always served with a small saucer of Kraft butter pats and Welch's grape jelly trays. I had some of the best diner coffee here, strong and steaming hot. 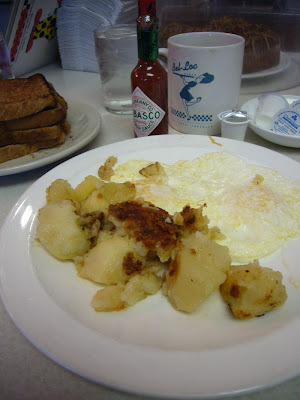 Mr. S and I both had fried eggs, over easy, with hash potatoes and toast. He ordered an additional piece of Scrapple, which was sliced to the perfect thickness and fried crisp on the outside, soft in the middle. The potatoes had pieces that were well-browned and other huge chunks that were almost like they'd been boiled, all soft and buttery in texture. We ended up being too full to order any of their homemade desserts, namely apple and blueberry pie, lemon meringue pie, and carrot cake. The cakestands were also full of large tender muffins, from Costco. (If you've ever had a Costco muffin, you know they are pretty good and huge!) Next time we go, I'll have to try one of their milkshakes, which I hear have a following of their own.